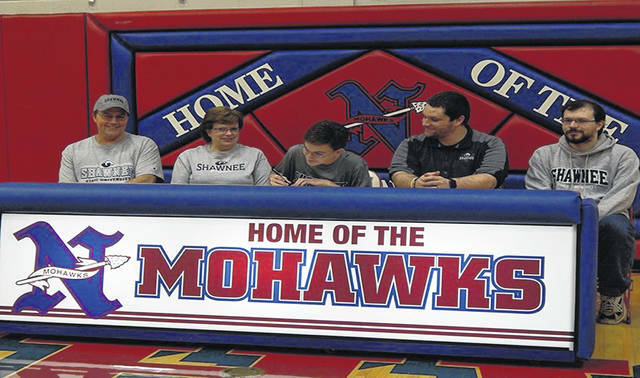 Northwest senior Patrick Redoutey signed with to be a part of the Shawnee State eSports team at a signing ceremony at Northwest HS. Portsmouth, Ohio – Shawnee State esports is proud to announce the signing of Patrick Redoutey from Northwest High School. During Redoutey’s time at Northwest he was a four-year member of the soccer, swim, and marching band. With marching band, he went to four OMEA state final competitions. Redoutey’s junior year, NHS soccer won the conference, sectional, and district titles with a record of 19-1. Redoutey also won the Coaches Award in 2018 for soccer. Redoutey was named first team all- Southern Ohio Conference for swim in 2019. Redoutey is planning on playing Smash Bros. Ultimate and Hearthstone for SSU. Redoutey is going to double major in game design and computer programming during his time at Shawnee. Kyle Trapp head coach of esports is eager to see what Redoutey brings to the table. “I am beyond excited to bring Patrick Redoutey on this Fall. I have known Patrick for the past few years he is a great kid and I am excited to see him become a student athlete with eSports,” said Trapp. Redoutey is the first esport signing of the year and is the first local recruit in the history for Shawnee State University’s esoprt team. For more information on recruits and other esport news got to ssubears.com.